Spring is in the air, at least on 34th Street! After a really long and torturous winter, could it be possible that spring is finally here? Tree buds are working hard to open and hopefully we can retire our winter hats, scarves and gloves for the season. Some buildings in NYC seemed to have early-onset wishful thinking! Just take the HSBC headquarters on 40th and 5th as an example - their premature (yet totally gorgeous) flower display gave pedestrians a glimmer of hope that the warmer weather was near -but unfortunately Punxsutawney Phil was right again - the flowers did not quite make it through the bitter cold of the extended winter weeks. Not all hope is lost though! Despite the 6 weeks of wintery doom that our dear groundhog friend placed upon us -spring has magically appeared to 34th Street in flying colors (literally) by the opening of Macy's Herald Square 40th Anniversary Flower Show- aptly named, The Secret Garden! As we trudge through the last few painful days (weeks?) of frozen weather - don't be another jaded New Yorker. Instead of just walking by Macy's Herald Square on your commute to work, walk through the store and breathe in a dose of spring! 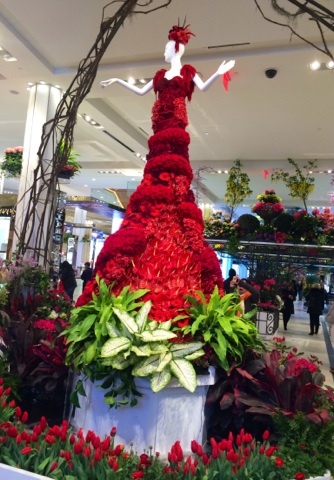 Featured in the front entrance, is the iconic, "Lady in Red", a 14-foot floral sculpture made out of an array of gorgeous red flowers in couture-inspired attire. Holy moly, one cannot even imagine how much a spectacular display of over 3,000 buds would cost! The answer - more than most can afford! I promise it will put a smile on your face though. The good news is, you don't need to break the bank! Take inspiration from this floral "Miracle on 34th Street" and instead of the typical flower arrangement, hang colorful, playful buds in mobile formation over your buffet or bar at your next event. How cool would that be? Maybe this week will feel more like spring (finally…cross fingers...hopefully). 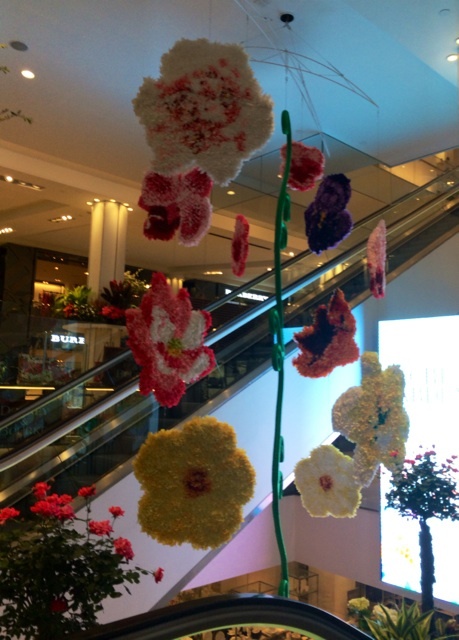 Either way though, spring is definitely in the air at Macy's Herald Square until April 6th. Enjoy and happy spring!